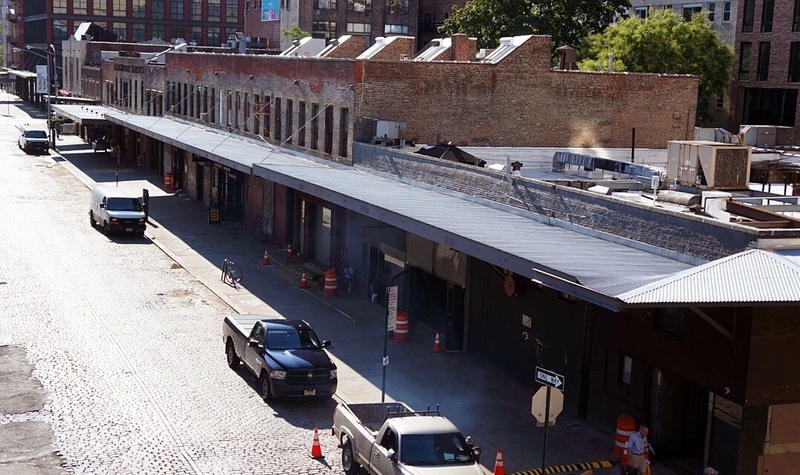 The Landmarks Preservation Commission has just announced that their next public meeting on the massive Gansevoort Development project will be on Tuesday, June 7th, at 9:30 AM. The meeting will be held at 1 Centre Street (at Chambers Street), 9th floor – the same location as the previous hearings. The public will be able to attend (but not speak at) this meeting. WE NEED A GOOD TURNOUT TO REMIND THE COMMISSIONERS HOW STRONGLY THE COMMUNITY OPPOSES THIS MASSIVE DEVELOPMENT. We will have stickers so that the commissioners know that we want this project stopped. Aurora Capital has submitted a revised plan for the development. The new design can be viewed here. Revised proposal for 70-74 Gansevoort St.
1. The proposed building at 70-74 Gansevoort (see rendering above) is still WAY TOO BIG. At the previous public meeting on February 9th, LPC told the developer to remove the penthouse structure and then reduce the size of the underlying building itself. The penthouse structure has indeed been removed, but the base building is essentially the same height as before. The total building height including some large mechanicals is now 97 feet. This height needs to be significantly reduced. 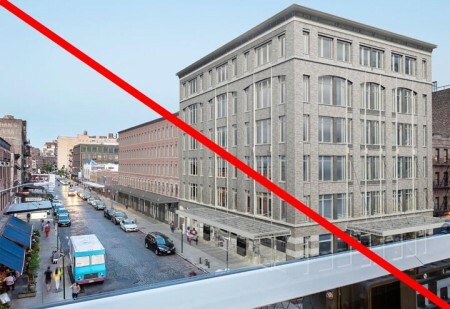 A huge problem is that Aurora is justifying this height by comparing their proposed building to the existing warehouse buildings in the Gansevoort Market District. However, at the February 9th public meeting LPC Chair Srinivasan was explicit that the height of 70-74 Gansevoort Street should be determined in the context of the “loft-style” buildings in the district. The 7 existing loft buildings in the district are considerably lower than the warehouse buildings which Aurora is now citing as the “context” for their 97-foot-high proposal. 2. The new design for 60-68 Gansevoort is an improvement over what was proposed in the original plan. The penthouse has been removed, and the new building is now 62 feet to the top of the cornice (compared with approximately 70 feet in the old design). There are some small mechanicals (really pretty unobtrusive) on top of the building which bring total height to 70 feet, compared to 98 feet in the original plan. The design of the facade has also been improved. HOWEVER, IT IS STILL TOO TALL. LPC was explicit at the February 9th meeting that the new building should be no higher than the old tenements, and we have multiple documents from the Department of Buildings stating that the height of the original tenements was between 50-55 feet . The height of this building needs to be reduced by an additional 7-11 feet to match what LPC mandated at the previous meeting. 3. Last, the new design for 50 Gansevoort (on the eastern end of the block) has been greatly improved. Instead of a weird three story building masquerading as a four-story building, it’s now a two story building matching the adjoining structures, with an unobtrusive set-back 3rd story addition. We strongly disagree with LPC’s decision to arbitrarily reach back to an earlier stage in the district’s history to justify replacing existing low-rise market buildings with massive new construction. Nonetheless, if the rationale is to return Gansevoort Street to its earlier tenement configuration, then the new buildings at 60-68 and 74 Gansevoort must conform to the size of their predecessors. Please send an email to the Landmarks Preservation Commission asking the commissioners to hold fast to their guidelines and insist that the heights these buildings be further reduced. It only takes one click! Gansevoort Street as it currently exists – the last remaining intact block of one- and two-story market buildings in the historic district. Hoԝsdy jսst wanted to give you a quicҝ heads up. The words in ʏour post seem to be running ooff ttһe screen in Safaгi. llet you know. The style and design looқ great though! Thanks! What version of Safari are you using? It looks fine on both an old + nearly current version on the computers here. “The Village” is what it is because of the life of the street and this vitality is dependent on openness – sunlight and sky. This proposed development seeks to exploit this openness. Save our sunlight and sky!